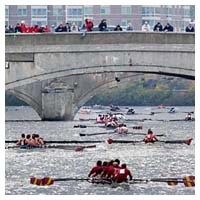 The 43rd Annual Head of the Charles Regatta is almost here! This weekend, more than 8,000 athletes will row in over 50 events down the historic three mile racecourse in front of over 300,000 spectators. There will be many current and former Exonians at the regatta, on the water and off. The Exeter Assocation of New England will have a tent set up in Reunion Village on Saturday and Sunday (volunteers will be present from 11:00AM – 2:00PM). A $1 fee is required for all-day access to Reunion Village, the proceeds of which will benefit a local charity. Reunion Village is located on the southern (Brighton) bank of the river near the John W. Weeks Footbridge, around halfway down the racecourse and a ten minute walk from the Harvard Square MBTA station. (Click here for a map). The Village is a prime spot to view passing races and especially collisions that frequently occur as coxswains try to manage the ninety degree port turn through Weeks Bridge. So stop by, have a drink, and watch the races with other Exeter students, alumni, alumnae, parents and friends. On the water, Exeter students and alumni/ae will join the thousands of athletes racing in the regatta. If you are competing and not listed, please send me an e-mail so I can add you. A Director’s Challenge Quad in memory of Andy Sudduth ’79 (pictured right) will race on Sunday afternoon. 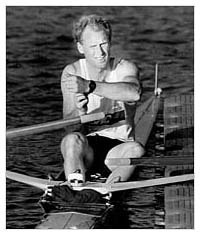 Sudduth rowed at Exeter, Harvard, and for the United States in a number of Olympic Games and Rowing World Championships during the mid-1980s. In July 2006, after battling pancreatic cancer, Sudduth tragically died at the age of 44. In memory of Sudduth’s strength of body and character, Kate Bryant ’80, Trevor Laughlin ’79, Sharon Vaissiere ’76 and one other will row in the Mixed Director’s Challenge Quad Event on Sunday around 1:09 PM. Andrew Safir ’08 and Vaughan Coder ’08 are rowing in the Men’s Youth Double event for Durham Boat Club on Sunday morning. Their bow number is 15, and will probably cross the starting line around 9:35AM. Nick Lacava ’06 and Oskar Zorilla ’06 are racing in the Men’s Lightweight Eight event for Columbia University on Sunday afternoon. Their bow number is 9, and will probably cross the starting line around 3:00PM. Daniel Mahr ’07 is coxing in the Men’s Championship Eight event for Brown University on Sunday afternoon. His bow number is 37, and will probably cross the starting line around 4:10PM.